Montana Republican U.S. Senate candidate Matt Rosendale lit into big government omnibus spending bills during an interview on Breitbart News Sunday on SiriusXM’s Patriot Channel 125 this weekend, including bashing a pet project for New York City that Senate Minority Leader Chuck Schumer is trying to insert into the bill despite President Donald Trump’s threat to veto the bill if it is included. Host Matt Boyle asked Rosendale about Schumer’s efforts to put $900 million in funding for the “Gateway” project into the omnibus spending bill, a project that now is estimated to cost federal taxpayers nearly $30 billion, despite initial estimates of just over $10 billion. The project would build a series of bridges and tunnels from Newark, New Jersey, into Manhattan in New York City–but as Breitbart News exposed it has received no funding from the states of New York or New Jersey and is seeking to be funded entirely by the federal government. Trump has threatened to veto the omnibus if the project’s funding is in the bill–and now Schumer’s efforts are causing negative political consequences for his vulnerable members up for re-election this year, such as Montana Democrat Sen. Jon Tester. Tester is one of ten Senate Democrats up for re-election in 2018 in states where Trump defeated Democrat Hillary Rodham Clinton in 2016 and one of the most vulnerable senators facing voters again. Now, Rosendale is hammering Tester for standing with Schumer and New York City against the people of Montana–who get no benefit from this project but are paying for it if Schumer gets his way–on the Gateway project. Rosendale is running on a pledge to stop the practice of giant omnibus spending bills filled with waste, fraud, and abuse of taxpayer money–bashing the big government process that led to this point. “This is something that I’ve been talking about since I thought about politics and have engaged in the process going 37 years back, when I was 20 years old,” Rosendale said on Breitbart News Sunday. He called out Schumer for consistently pushing spending increases. Tester voted along with Schumer to shut down the government for a couple days in what became known as the “Schumer Shutdown.” The shutdown effort was so disastrous for Democrats politically that Schumer could not even last a full business day and completely caved to Republicans by midday into the first business day of the shutdown–prompting leftist pro-amnesty protesters to storm his residence in New York. Rosendale said that the median income in Montana is $48,000 and that the vast majority of people in the state are seeing an increase in their income as a result of the tax cut bill. Asked about the push for gun control, Rosendale recalled the 17 souls lost in the tragic Florida school mass murder in February and all others affected. He then called for good policy in response, thinking thoroughly through policy to have a positive impact, not simply knee-jerk reaction. He spoke of participating in passing legislation in Montana to get treatment to those in the state suffering from mental illness. Boyle recalled Tester’s vote for Obamacare in 2010. 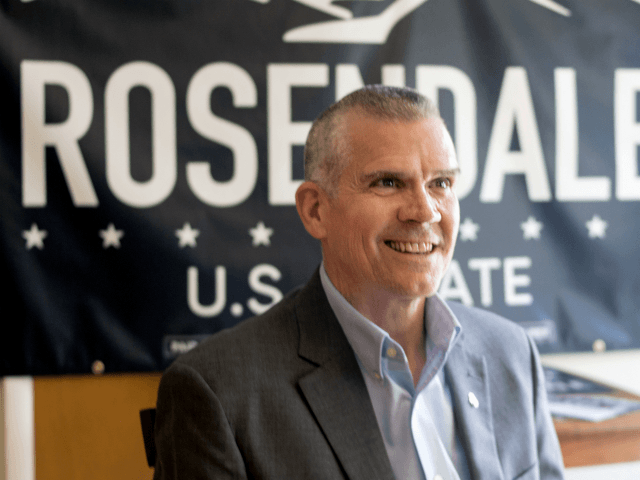 He asked Rosendale, as state auditor, what he is doing in Montana now to help residents with health care. Rosendale said he focused on working on solutions that provided people with health care, not merely insurance. Welcoming healthcare sharing ministries into the state and authorizing primary care agreements were among the ways Rosendale said they accomplished this. These agreements involve a flat fee in exchange for a list of primary care offerings. He spoke of changes from the federal tax cut bill that has also opened up options for people’s healthcare needs. Breitbart News Sunday airs Sundays on SiriusXM’s Patriot channel 125 from 7:00 p.m. to 10:00 p.m. Eastern.